I ended up with some .bat file in my solution. For example diffMapping.bat uses WinMerge to compare the mapping I currently use to one that I just generated out of my Domain assembly. Then I wanted to be able to run this .bat script from the IDE, without having it in Visual Studio 2005 External Tools menu (not tried with 2008 currently). So I tried the right click on the .bat Open With, then gave the path of cmd.exe. That’s was not working, it just opened a cmd prompt. Then I pointed Open With to PowerShell exe and it works!!! It will run you .bat file from Solution Explorer. 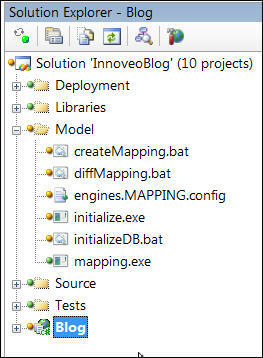 You can even define it as the default program for .bat and double clicking on a .bat file in Solution Explorer will run it.